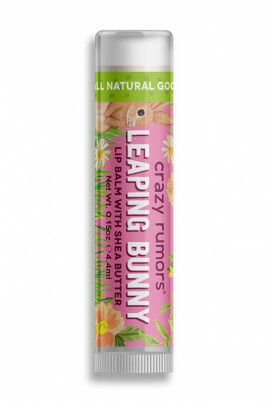 CRAZY RUMORS Natural Lipbalm Leaping Bunny gives you a nice plum and apricot taste ! A portion of this sale will be donated to the "Cruelty-free Leaping Bunny" which promotes animal respect and goes against animal experimentation. Its formula rich in organic shea butter nourrishes and protects your lips, they are smooth and delicately fragranced. Crazy Rumors Lip Balms are 100% natural, cruelty-free (not tested on animals) and vegan (no animal-derived ingredient). Crazy Rumors Lip Balm supports the Leaping bunny cruelty free association !